Lately I have been finding beautiful blessings everywhere. It started with Jan Richardson’s work. Then I found a book of Celtic blessings in a used book store. I hear them pronounced over our congregation each Sunday. I’ve been blogging my grandmother’s touching poems. I am in awe of people who can put such beauty and faith into a few short lines. Now there’s a stack of blessing books by my bed. I read them right before I fall asleep and if I haven’t snoozed the alarm, before I get out of bed. If I wake up in the night and a can’t go back to sleep, I reach for these books of blessing. They are comforting to the soul. The easiest way to learn to write a blessing is to do it, according to Barbara Brown Taylor in An Altar in the World. She suggests beginning by blessing any old stick you find lying around. “Bless you stick, for being you.” I visited some redwoods in California recently and was inspired to try a blessing. 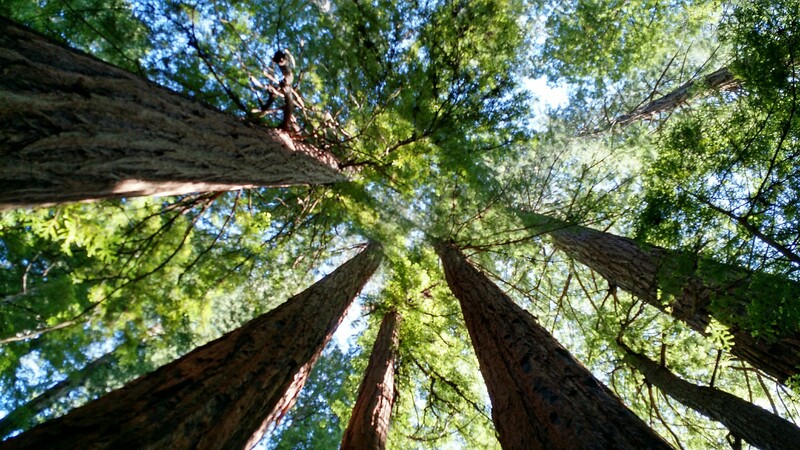 When I think about it, redwoods could be considered giant sticks. So, here’s to trying a new spiritual practice right here on the internet. I am blessed by your generous reading. In the silent forest, may you find the stillest place for your soul to breathe. As you stand at the base of these ancient, mysterious beings, know that God has created you, just as magnificent a wonder. Gather strength from these steadfast trees, who know nothing but to grow deep roots and stretch toward the heavens. "I have seen the Lord."